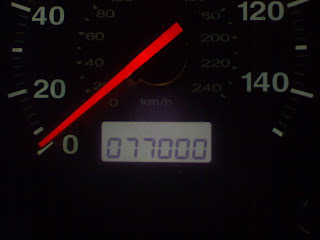 Brown Brown: 77 000 Miles! My beloved Honda has traveled with me for over 77,000 miles. She hit the magic 77 a few days ago. She's been good, reliable, warm, and safe to me. Need to get her to the shop soon for some new shoes (brakes) and flange gasket. Can't complain when she gets me close to 40 miles per gallon. I love my Honda!